I love photographing weddings for the Heritage Golf Collection on Hilton Head Island Port Royal, Shipyard, Palmetto Hall, and Oyster Reef Golf Club. A gorgeous venue, on the golf course, incredible chandeliers, space, columns decor, unique and different in its on way with a beautiful venue, and outdoor setting to include a green lawn perfect for cocktail hour, while looking at the golf course. Wedding images I create tell a story. I had lots of time with my couple after the ceremony to capture images of them both with the bridal party. The best men had told me previously that the groom had something very special that he wanted to photograph. I had no idea what is was. I decided to capture a shoe photo representing the groomsmen shoes with the groom and the bride, on the lawn of Port Royal Golf in Hilton Head,Sc. 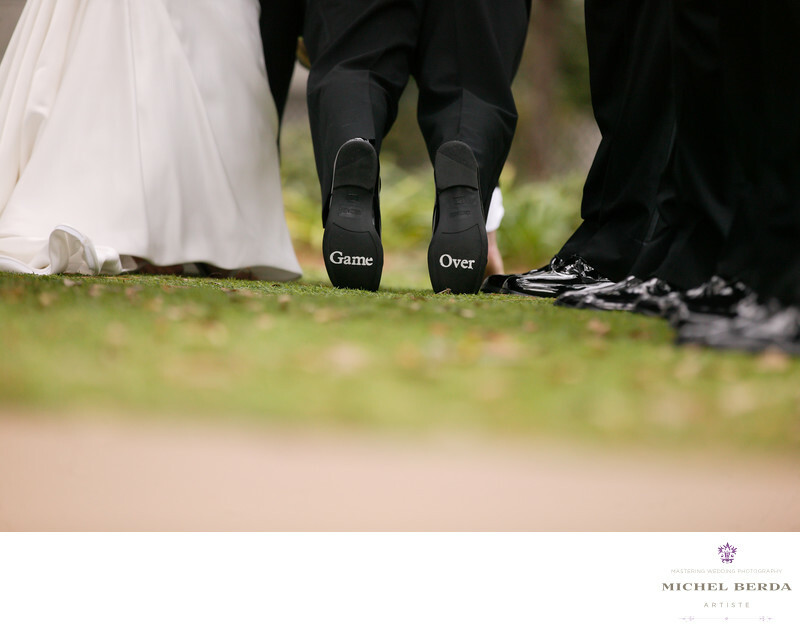 After that photo was captured suddenly the groom started to get down on his knees, I saw the soles of his shoes, that said" Game Over" quickly I captured it while the groomsmen started laughing, the bride still had no idea why they were laughing about, then the bride looked over her shoulder & saw the bottom of his shoes. A perfect moment, a wedding images they will cherish for a long time. Keywords: Destination Wedding Photographer (117), Port Royal Shipyard Hilton Head Sc (6), Port Royal Shipyard in HHI Weddings (6), sc (309), Wedding photographer In Hilton Head (66), Wedding Photographers (198), Wedding Photography (123), Weddings (168).